President Serzh Sargsyan today in Brussels met with the High Representative of the EU for Foreign Affairs and Security Policy and Vice-President of the European Commission Federica Mogherini. At the beginning of the meeting, the President of Armenia stated with satisfaction that the meeting with Mrs. Mogherini is taking place at the important for Armenia and the EU juncture: a day before President Sargyan and President Tusk announced the conclusion of the negotiations on the new framework agreement. 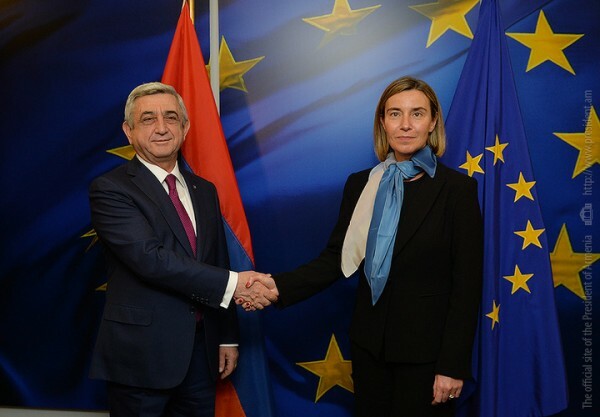 Serzh Sargsyan assessed as important the fact that only one year ago, the process of the negotiation on a new legal document, which was announced personally by Mrs. Mogherini, was being discussed in Yerevan. President Sargsyan said that this achievement was a result of the mutual commitment and a dedicatd and serious work of both parties. The parties discussed a wide range of issues pertinent to the futher development and strengthening of the Armenia-EU relations. The President underscored that it is proper indeed to speak of joint accomplishments of the last two years. At the President’s meeting with the EU High Representative, just like at the meeting held a day before with the leaders of the EU structures, the parties spoke about the reforms carried out in Armenia in different areas, large-scale works implemented after the constitutional changes aimed at the developing and strengthening of the democratic institutions in Armenia, as well as about the upcoming parliamentary elections. In response to Mrs. Mogherini’s question, President Sargsyan spoke about the preliminary works for the parliamentary elections and expressed gratitude to the EU for the assistance in conducting the elections. The two sides discussed the NK peace process, existing problems and concerns. The President of Armenia spoke in detail about the destructive position of Azerbaijan, about the provocations incited regularly by the Azeris at the contact line with Artsakh and Armenia’s state border, their refusal to implement agreements reached in Vienna and Saint Petersburg, which, according to President Sargsyan, challenges the years-long efforts of the international community aimed at a peaceful resolution of the conflict and the entire preace process.